2 & 3. Freight Wagons - 1880's. These particular wagons saw hard service in the Imperial Valley. 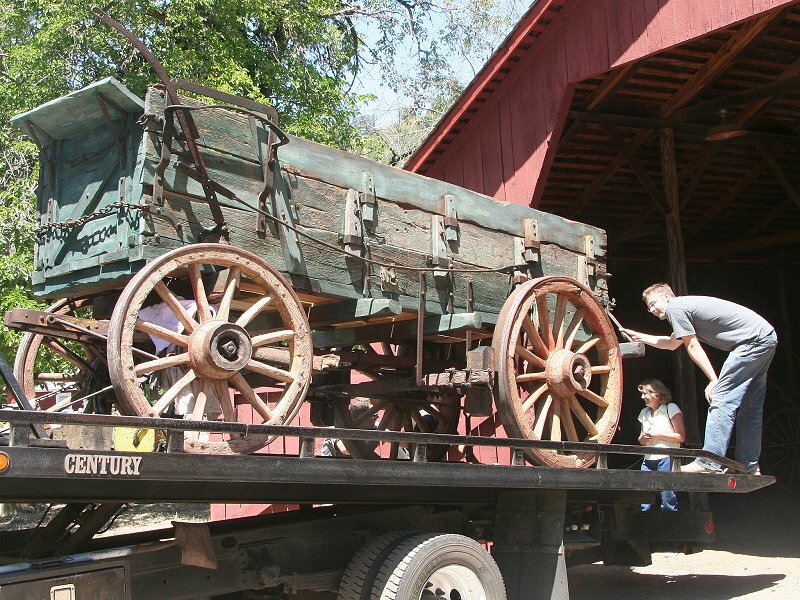 Similar wagons plied the foothills and Sierra mountain roads, including the Virginia Turnpike through the covered bridge. They carried up to 4000 pounds each of a variety of goods, and had a working life of about 4000 miles. They are the forerunners of present-day semi trucks, and provided food and supplies to the northern gold and silver mining communities. Right side of this freight wagon as it is backed into its new home in the barn. 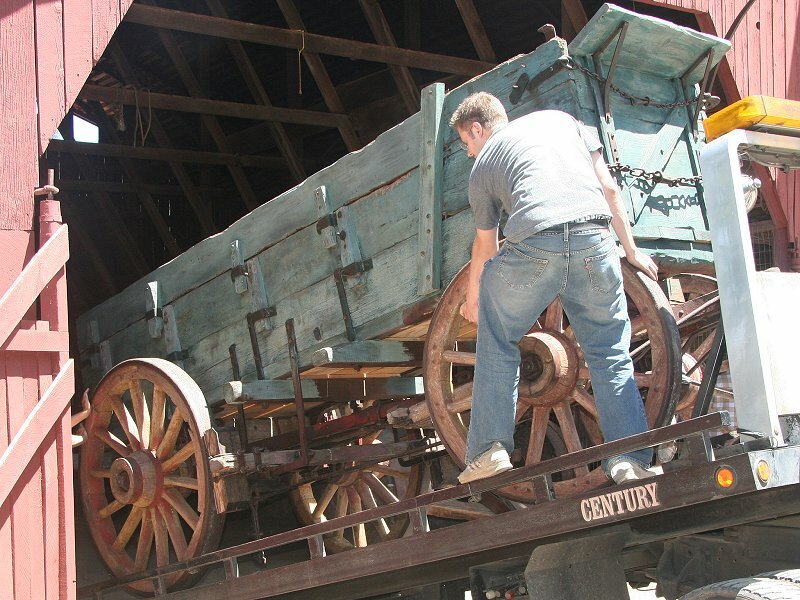 The top two boards on each side of this particular wagon were removable to accommodate various load. Left-side-brake freight wagon, during its return to the barn after being "conserved." The front of the wagon (with smaller wheels and the river's footrest) is on the left in this picture. 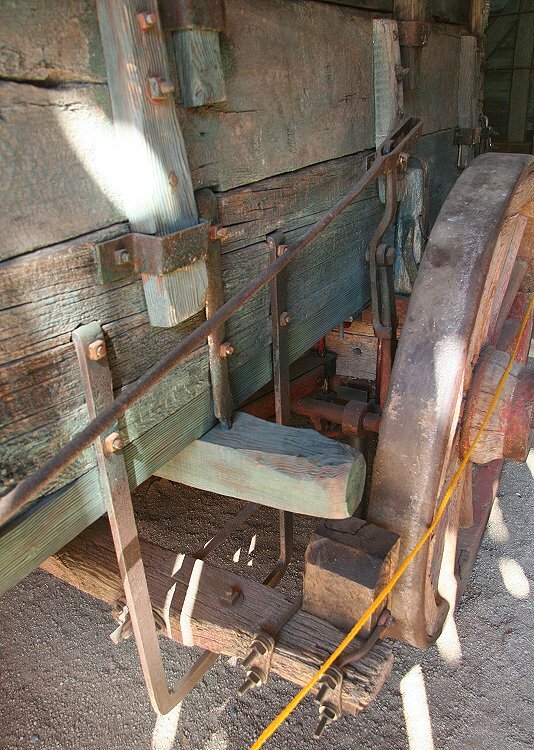 This wagon has the driver's brake lever on this left side, which can be pushed either by hand or foot (note: foot pedal). 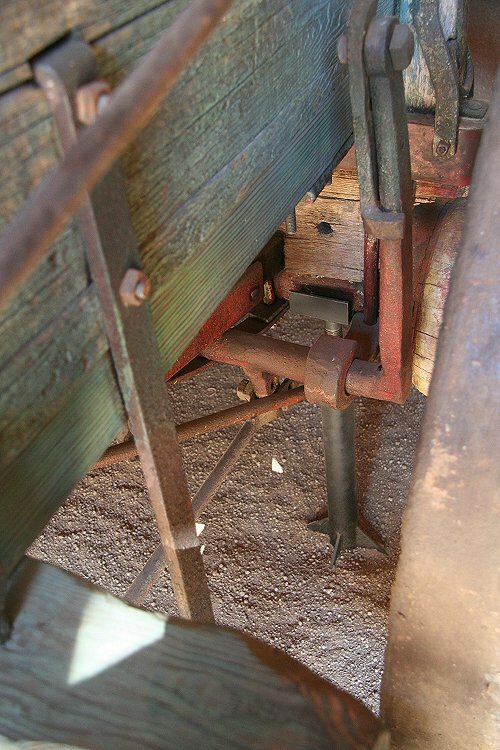 Other pictures show the lever system that presses the brake shoes against the wheel rims. The brake tie rod seen in this picture links to the long vertical lever seen in the picture here. This lever attaches to a hefty shaft (detail in next picture). Welded to the under side of the shaft are two more levers, one for each side of the brake beam. These are linked to tie bars pierced through the brake beam. Attachment to the brake beam is in the previous picture.